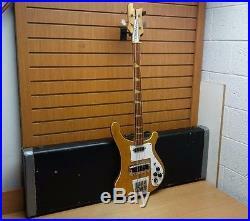 Rickenbacker 1973 Model 4001 Bass Guitar Natural Finish As Is. Item listed shows signs of use from previous owner. Cosmetic condition has marks, scratches, scuffs, dings, and some tarnish on hardware. The Serial Number is MJ4838 which I used to date this Guitar to October of 1973. The tag is cracked behind the left screw. The neck is warped, the frets have some cracks on them. And the fretboard is cracked by the base and top of the neck. There are some cracks in the wood on the top/back of the headstock and neck. The bridge appears to be off center and the strings are not aligned properly. The tops are missing from 3 of 4 pots knobs. The electronics on this guitar are still in working condition. Includes Hard Case that is very worn and the latches are rusty. The case is lined with blue felt. I describe the items to the best of my ability. All items are in working order unless otherwise stated. If you have any problems with the item, please message me and we will resolve the issue. The item "Rickenbacker 1973 Model 4001 Bass Guitar Natural Finish As Is Parts or Repair" is in sale since Wednesday, March 08, 2017. This item is in the category "Musical Instruments & Gear\Guitars & Basses\Electric Guitars". The seller is "sdsellers" and is located in Glassboro, New Jersey. This item can be shipped to United States.